In a (hopefully not futile) attempt to wrangle my TBR list into some kind of submission, every month I plan to read a book that has been languishing on the shelf. 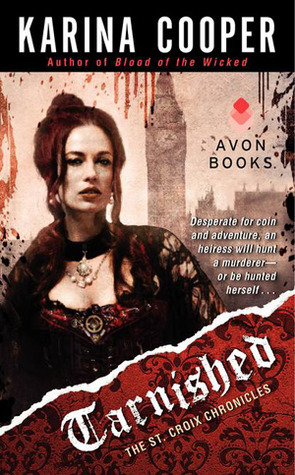 This month I will read the first book in Karina Cooper's St. Croix Chronicles, TARNISHED. I've been wanting to try this book for a while now. So many of my friends liked it and it sounds like something I would love: troubled heroine battling addiction, a double-life, lots of action, enigmatic characters, all that good stuff. It is way past time for me to move this book to the top of the pile. Here's the blurb: "My name is Cherry St. Croix. Society would claim that I am a well-heeled miss with an unfortunate familial reputation. They've no idea of the truth of it. In my secret world, I hunt down vagrants, thieves . . . and now, a murderer. For a monster stalks London's streets, leaving a trail of mystery and murder below the fog. Eager for coin to fuel my infatuations, I must decide where my attentions will turn: to my daylight world, where my scientific mind sets me apart from respectable Society, or to the compelling domain of London below. Each has a man who has claimed my time as his—for good or for ill. Though as the corpses pile, and the treacherous waters of Society gossip churn, I am learning that each also has its dangers. One choice will see me cast from polite company . . . the other might just see me dead." What book is waiting for you on your bookshelf?